Hernia is noted as one of the most common health issues experienced by people in different parts of the world. Though it does not causes severe complications to the patients, the constant or chronic pain related to the condition often make people to visit a specialist doctor for treatment. Whether you are a man or a woman, young or an elderly person, you can be at risk of getting a hernia. Yet, the condition can be avoided if you are aware of the major causes of the condition and avoid it in an intelligent manner. Hernia is a medical condition in which an organ pressurizes through any tissue or muscle opening and covers up the space. In some cases, it is the intestines that tries to push out of the walls of the abdomen while in some other cases, hernia may occur in the groin area, belly button or in the upper thigh. Though hernia in most of the cases cause severe pain to the patients and symptoms at times may become unbearable, it does not generally have any threat to the life of the patient. Hernia treatment in India as well as in abroad is also quite simple and can be obtained under the guidance of an expert medical practitioner or doctor. Depending on the place of occurrence, hernia mostly needs surgery or operation. Yet, a single surgery does not reduce the risk of hernia recurrence. Therefore, it is always recommended to act carefully for reducing the risks of hernia surgery. Obesity – Almost everybody is aware of the fact that obesity or excess weight gain has become one of the major health problems of the present days. Yet, you may not know that obesity paves the way for several other health problems. 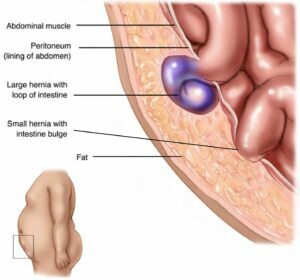 Hernia is one of the major health problems experienced by obese people and you may also like to know that people who are obese have higher risks during the hernia surgery. In most of the cases, doctors need the patient to slim down before operating them. Also in some cases, obese patient complain of tearing their hernia all over again after treatment. Diabetes – Diabetic patients are also at a higher risk of getting hernia treatment in India. Doctors recommend them proper diet chart and medicines for controlling their blood sugar level before operation. Lifestyle – You may not know that your lifestyle problems may also increase the risks of hernia. People who lead an extremely stressful life or have to lift heavy weights may get hernia all over again after surgery. Some people may also complain of post-surgery complications after lifting heavy weights. Hernia surgery or hernia treatment has become quite simple these days. Yet, you need to get the assistance of a reputed doctor in this field. If you or any of your near ones is dealing with the problem of hernia, it is important for you to opt for immediate treatment and check severe complications. When selecting a doctor for your treatment, it is always advised to check their reviews at first and do not make the decision based on their fees.